Sophie Dekkers shared the airline CEO's advice on ditching the guilt as a working mother at MT's Inspiring Women Birmingham conference. Rising the ranks at easyJet (five roles in seven years), Sophie Dekkers quickly realised she needed to adapt her approach to work – particularly in meetings. 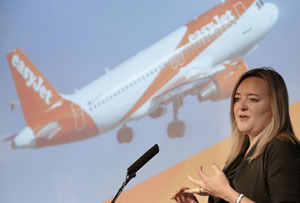 And Dekkers says McCall completely changed the culture at easyJet when she became CEO ‘away from a finger-pointing one’. Under former CEO Andy Harrison, Dekkers says the atmosphere within the business was ‘quite aggressive, quite a bully culture with people standing up and slamming their fists on the table’. All the female leaders she saw at that point ‘were turning into men when trying to get a point across, starting to use the F word, swearing’. She recalls someone telling her that McCall was ‘the sort of person where you can go into a meeting with her, she will fire you in that meeting but you’ll still come out feeling positive about yourself and it’s absolutely true’. 1. Be there for the dates that matter – make sure that you’re there for school plays and sports days. Make those times sacred in your diary. 2. Go home early to balance the nights away – even if you have to work after they’ve gone to bed.